Includes an interview with Steve White – who was the drummer with the Style Council (Paul Weller) and other worthwhile bands. 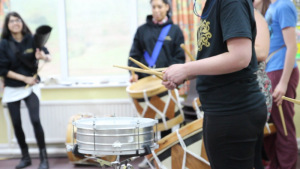 ‘Future Leaders’ apprentices (aged between 13 and 25 depending on the art form) will extend their practical skills in carnival arts based music making, dance, visual arts and drum kit, as well as gain project management experience, guided by leading artists and professionals in their field. 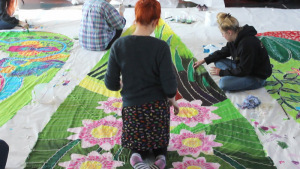 Study opportunities include residential weekend workshops, business and project development, and CPD (continuing professional development), all cemented by distance mentoring from leading UK and international artists and practitioners, tutorials, and portfolio work. Hardeman, Grupo Ilu Axé, recorded live at Trinity Centre, Bristol, 2014.
organisations, funders and individuals that made this possible. In respectful memory of Mat Fox. a Metaceptive production for Global Grooves. 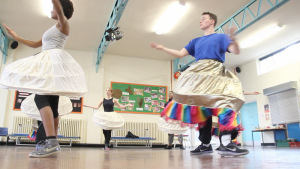 Tagged apprenticeship, art, carnival, dance, film, future leaders, global grooves, kooj chuhan, music, short film, training, uk, video, visual arts, youth arts. Bookmark the permalink.